In today’s Lightroom tutorial I want to show you how merge Lightroom catalogs functionality helps me to mange multiple catalogs when I travel. As an early adopter of Lightroom, my editing workflow has gone through a series of evolutions over the years. When Lightroom’s beta version was released, there were no tutorials or guides, which left early adopters like myself to figure out each and every step of the workflow on our own. My first big mistake in how I used Lightroom was due to the fact that I did not fully understand the concept of the Lightroom Catalog. 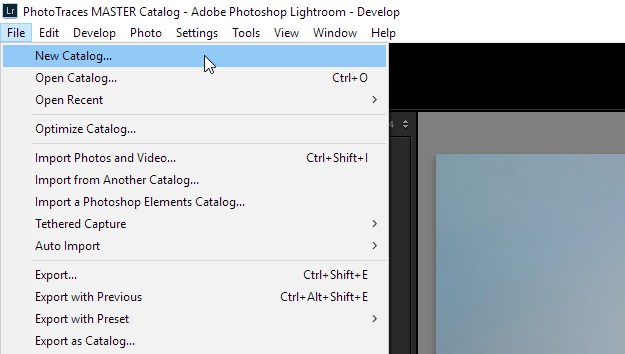 After using Adobe Premiere and After Effects frequently for years, I assumed that the Lightroom Catalog was the equivalent to the Project in other applications. 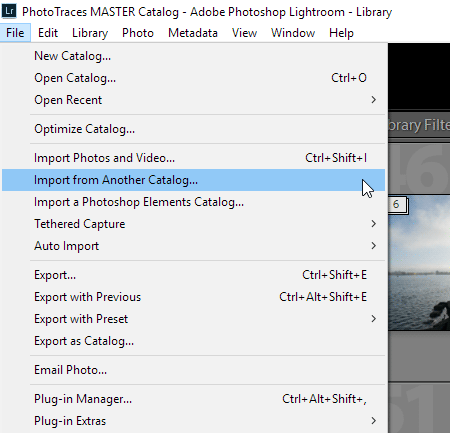 This assumption led me to create and manage multiple catalogs in my early Lightroom days. As a result, I gained firsthand experience and a greater understanding that managing multiple catalogs was hell. Since it is impossible to search for photos across separate catalogs, I had to close and open catalogs multiple times. I also had to remember what photos I kept in each catalog. Like I said, it was absolute hell. After I learned my lesson, I combined my catalogs together by creating one Master Travel catalog. At the same time, I kept a separate catalog for my family photos. The idea was to separate (and keep separate) my travel photography from personal stuff. But, this did not work well. The line between professional and personal work is blurry at times. I often had photos from both categories on the same memory card. This meant that I had to import photos twice into different catalogs. It did not make any sense. That is when I realized that one catalog approach suits me the best. Right now, I have one catalog of about 120,000 photos with professional and personal projects organized by tags and albums under one umbrella – the MASTER Catalog. 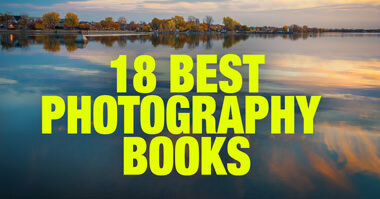 But, there is still a place for multiple catalogs in my travel photography workflow. I use them when I travel. My desktop computer is the center of my editing workflow. This is where I permanently keep my Master Catalog. I know some photographers who bring their master catalogs with them when they travel by transferring it from their desktop to their laptop; but, this is not effective or efficient for my workflow. For every trip, I create a brand new TEMP catalog on my laptop. After my trip is over, I delete it and create a new one as the next trip approaches. I create the TEMP catalog on the primary hard drive of my laptop and by default Lightroom generates the preview files next to the catalog. At the end of each day of my trip, I import the new photos from that day to my TEMP Lightroom catalog. For the RAW files destination, I choose one of my external hard drives. I use the following settings during the import process. For Previews, I use the MINIMAL option. I check the Create Smart Previews option since the Smart Previews are an integral part of my travel workflow. I avoid doing any serious editing when I travel. I prefer concentrating on exploration and shooting. But, what I like to do when I am on a plane for anywhere between 6 and 10 hours is to start organizing and culling new photos. This is when Smart Previews come into play. 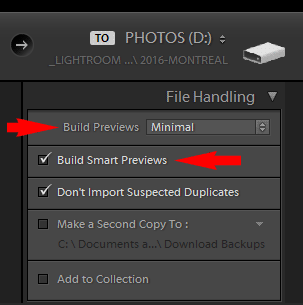 ​When Smart Preview is generated for any given photo, it allows you not only to view it in the library but also edit it in the Develop module when the original photo is not physically preset on your computer. 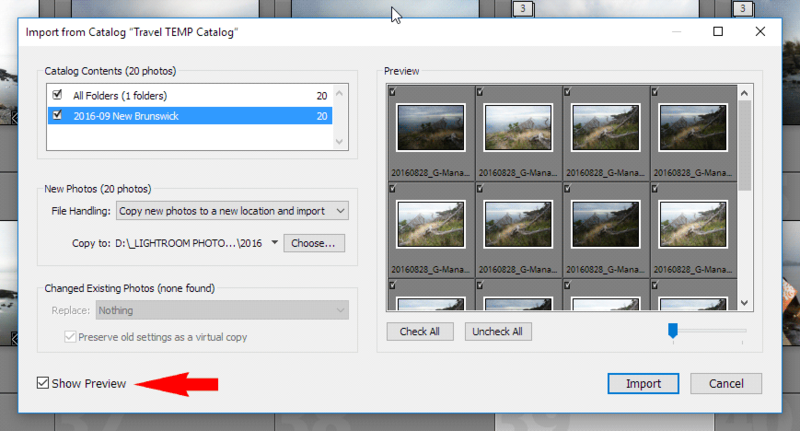 Instead of having to connect my external drive with all the RAW photos, I can manage the Catalog simply by using Smart Previews. First, I organize all the new photos into Stacks using the technique I outlined in detail in one of my previous tutorial (Automating Photo Organization in Lightroom) . Next, I use the REJECT keyboard shortcut (“X”) to mark all the bad images, like those out of focus or taken by accident. After I am done, I delete the images right away since I do not want to import them into my Master Catalog when I get home. Finally, I use the FLAG keyboard shortcut (“P”) to mark the photos I like and plan to edit in the future. This is all the Lightroom work I do when I travel. When I am back home, I connect my external hard drive with all the new photos to my travel laptop and copy the temporary travel Catalog file from the laptop to the external drive. I then connect the external hard drive to my desktop computer. Rather than using the command to Import Photos and Video, I use the Import from Another Catalog… functionality instead. This opens the Import from Catalog menu, which gives me multiple options including the option to import only selective files from the TEMP catalog. In my case, I always import the entire catalog contents since I never keep photos from any of my other trips in my TEMP catalog. I specify the folders I want to import and the destination on my desktop computer for new photos. When I hit the import button, Lightroom not only brings the new photos to the Master Catalog but also the metadata, edits, tagging, previews and albums. 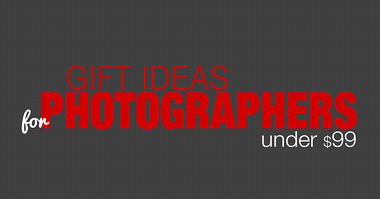 When you use Import from Another Catalog functionality, Lightroom does not generate brand new previews. It only brings existing ones from another catalog.​ And in case, you need to build 1:1 previews you need to use command Library > Previews > Build 1:1 Previews. 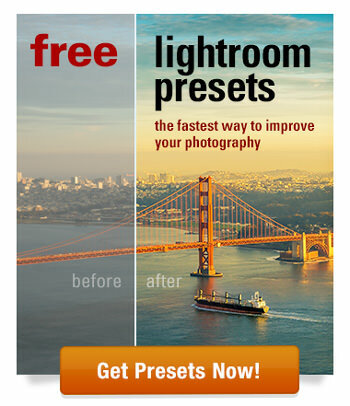 As I mentioned before, it takes time for Lightroom to generate Full Size Previews and Smart Previews at the same time. If I import 5,000 to 6,000 RAW photos in one setting, it might take hours. Normally, I start the import process in the evening and go to bed. By the next morning, everything is ready and I can start editing without wasting any time on organization (stacking, tagging) and culling. This is when I am finally ready to delete the TEMP catalog. 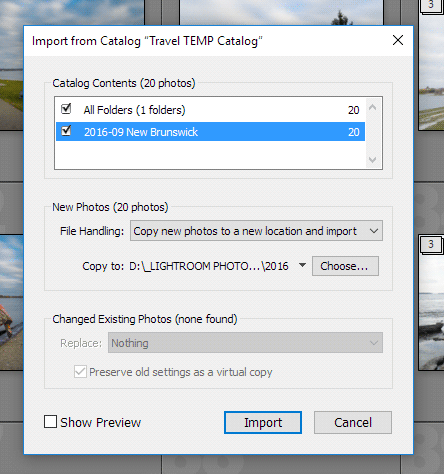 Even though one catalog organization suits my photography the best, the Import from Catalog functionality in Lightroom gives me the flexibility to use multiple catalogs when necessary without jeopardizing the simplicity of my travel photography workflow. I have a very similar approach. However, no matter what I try, I cannot sync keywords successfully. The hierarchy does not follow across. I never do complex tagging when I travel. I only apply top level tags like “California”, “Italy” or “Family” and it works well for me when I import from another catalog. I do more detailed tagging later at home when I start editing photos. my bad. Thanks a lot for letting me know. It is fixed now. This is so helpful for me! I have too many catalogs (and the scary thing is that I’m not sure how I ended up with so many). Thanks for your suggestions and help!